This luminous tale of loss, love and finding family is threaded through with the power of storytelling, and a touch of magic. Alberto lives alone in the town of Allora, where fish fly out of the sea and the houses shine like jewels. He is a coffin maker, spending his quiet, solitary days creating the final resting places of Allora’s people. Until the day a mysterious boy and his magical bird arrive - flying from danger and searching for a safe haven. Tito is fearful, suspicious of kindness, but as the winter days grow colder and darker, Alberto’s home grows warmer and brighter. Can Tito and his bird be sheltered from the town’s prying eyes and the shadows of their past? A story of life and death and of how hope can burn bright in a place faded by sadness. When a devastating plague sweeps through his little town, Alberto loses his whole family and the once happy and successful furniture-maker now applies his care and skill to making coffins. But when a mysteriously silent boy appears, Alberto’s life transforms. Their remarkable friendship brings unimaginable dangers – and this good but ordinary man must find extraordinary courage to save his friend. 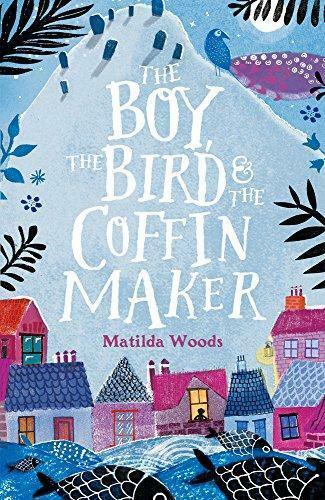 Refreshingly original, The Boy, the Bird & the Coffin Maker is an imaginative story which skilfully draws on a number of sources. It has an enchanting fable-like quality, offering richly detailed scenes and truly unforgettable characters. It explores themes of good versus evil, hope in the face of adversity, and the power of love and friendship to overcome grief. The story is lovingly crafted, taking its time to paint wonderful emotional and geographic landscapes, without sacrificing the story’s pacing or sense of adventure. A wonderful read-aloud story to share with the whole family. Don’t miss this beautifully written book, full of glorious illustrations that are guaranteed to tantalise readers. Highly recommended for ages 9+.